Allen Feinstein: Concerto for Euphonium "Swimming the Mountain"
Summary for the Busy Executive: Tuba lite. 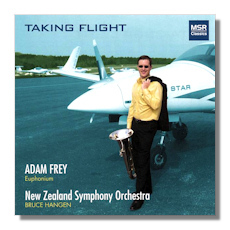 Another enjoyable recital CD from MSR Classics, this time with euphonium virtuoso Adam Frey, a faculty member at the University of Georgia. I admit I know next to nothing about brass-players' technique, but Frey struck me as superb. His tone is clear, and his phrases remain seamless even at low dynamic. He colors his line like a great Lieder singer, with a constant sense of forward motion and micro pushes, pulls, and shades. His tone often sounds as round as if he were playing the French horn. Of course, the euphonium has slightly more solo literature than chickens have toupees, so most of the program consists of arrangements. Some of them work; some don't. I don't hear any all-out disaster, but the Massenet Méditation, for example, seems ill-suited to the euphonium's low range – not that Frey doesn't sing beautifully. The program splits mainly between works featuring long singing lines and the equivalents of Flight of the Bumble Bee on tuba. The danger of the latter pieces are that you marvel that the player got through the piece at all, as opposed to your experiencing aesthetic satisfaction. I once heard Flight of the Bumble Bee on tuba. A fatter, more constipated bee you can't imagine. The Alfvén comes closest to this type of test, but Frey actually turns it from a triumph of the will to music, with real lightness in his tone, reminiscent of the violin. Allen Feinstein's concerto constitutes the one original item on the program. Feinstein, currently on the faculty of Boston's Northeastern University, wrote it for Frey. The work has an interesting genesis involving classical Greek poetry, which you can read about in the liner notes. The music is attractive, but not especially deep or individual. It reminds me, especially in its orchestration, of commercial music. However, it's very well made and the level of invention runs higher than normal. I enjoyed the CD, as I'd enjoy a summer bandshell performance or perhaps a seaside orchestra in Bath or Brighton during the height of the season.